An impressive array of Gift Vouchers makes for a convenient gift idea for your clients. Your clients can take advantage of your studio's voucher collection when they need to buy that special someone the perfect gift. Your Gift Vouchers can be for a specific dollar amount, or for a specific service or product. 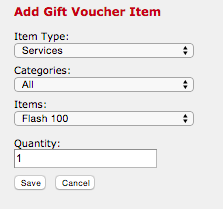 You will first need to create all of your Gift Vouchers via the Vouchers & Packages tab in your Admin page. Click New in the Gift Vouchers section and we can create our first Gift Voucher on the right side panel. Let's begin with the Gift Voucher Type as Cash. This means that the voucher is for a dollar amount, which can be used to redeem any service and any product to the value of the voucher. Let's create our $100 Gift Voucher. The Voucher Name: is an obvious one, $100 Gift Voucher. 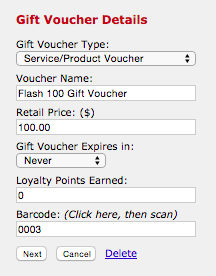 Gift Voucher Value: ($) is also 100. However, this doesn't have to be the same as the Retail Price. 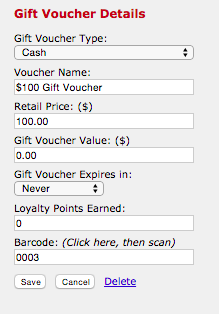 If you were promoting a $100 Gift Voucher, which comes with $150 value - then you would enter 100 into the Retail Price and 150 into the Gift Voucher Value. Gift Voucher Expires in: - you pick the expiry, it doesn't have to have one. Loyalty Points Earned - enter points here only if you want clients to receive points when they purchase this voucher. Barcode - if you have a barcode book at the front desk with all of your voucher types listed, you could scan the barcode in this section. Then in POS you can scan the barcode of the voucher type into the clients sale. GST Free - leave un-ticked. You have created your first Cash type Gift Voucher, now create the rest. Click New in the Gift Vouchers section and we can create our first Service/Product Voucher on the right side panel. Let's begin with the Gift Voucher Type as Service/Product Voucher. This means that the voucher is for a specific service or product. This type of voucher can be used to redeem the service or product which it specifies. Fill in the details on the right side panel, then click Next when you get to the bottom. Now we need to choose the Service or Product which this voucher is for. Then Save when you're ready. Your Gift Voucher selection is beginning to take shape. Continue adding in all of your Gift Vouchers and you'll then be ready to sell them. Now that you have created your Gift Vouchers, click here to learn how to sell your Gift Vouchers.